The following are newsletters from Lotus Elite clubs and publications. We are indebted to the clubs and authors for providing these resources to the greater Elite community. Written and published by Dennis Ortenburger. The 1950s were a dynamic decade for the motoring industry in Great Britain. The enthusiasts were hungry for high performance and racing cars after the austerity of the war. It was time to get back to the fun of driving again. One company stood out as the leader in building small bore racing cars and that was Lotus Engineering located in an industrial area of greater London called Edmonton. Number 7, Tottenham Lane to be exact. The premises were no more than a few small buildings next to a railway main yard. Especially remarkable was the fact Lotus Engineering Company was comprised of the founder, Colin Chapman who was yet to see his 30th birthday, a few paid employees, and dozens of enthusiasts who worked part time for nothing! Save for a beer and sandwich now and again and the excitement of being part of a world beating racing car company. Lotus' eleventh design was the superbly aerodynamic sports racing car that was dominating the small bore racing classes of the United Kingdom. 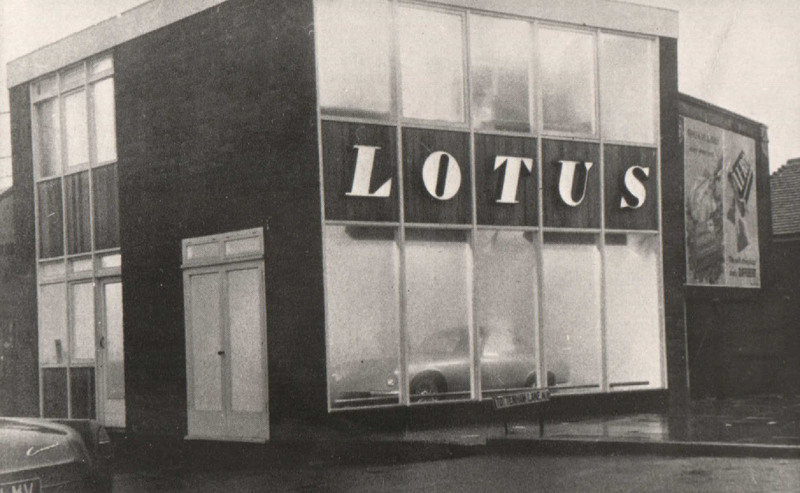 It set standards for chassis and suspension design that were copied by countless other builders and gave rise to the acknowledgement, "Nothing handles like a Lotus." The Eleven had won its class at Le Mans, established land speed record runs at Monza and defined the parameters of lightweight racing cars. Powered by the Coventry Climax type FWA engine, of 1100cc capacity, the Lotus Eleven not only established the Company as a leader in building winning racers it actually made Lotus some money. Enough, in fact, to enable Colin Chapman to look ahead to the day he would build a road car, suitable for racing of course. The first steps he took were to define the goals and purpose of this car. First and foremost, the car would be suitable for road use and rallies, such as the Monte Carlo but also be capable of a class win at Le Mans, which in those days was the premier road racing event in the world. The car would be constructed out of fiberglass with a target weight of 1300 pounds. Chapman had ruled out steel or alloy due to the tooling costs necessary, especially for the limited production numbers he proposed. What was extraordinary was Chapman's plan to build a fiberglass monocoque. There would be no metal chassis in the car save for a subframe to carry front suspension and engine loads and a steel roll over bar embedded in the fiberglass over the windscreen. The design would also be of a coupe to ensure body/chassis rigidity despite the large openings for doors, boot and bonnet. 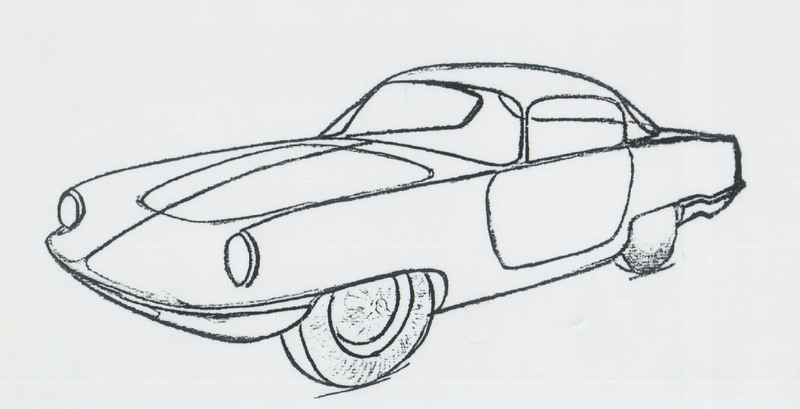 The new car would incorporate all of Frank Costin's aerodynamic advancements utilized on the Eleven and as a result of this it achieved an astounding 0.29 coefficient of drag. The car would have the same suspension system as the Lotus 12, which was Lotus first open wheeled racing car. Thus, all independent by wishbones at the front and Chapman struts at the rear. The brakes would be all disc but fitted inboard at the rear. The Lotus 12 also contributed its wheelbase and track. 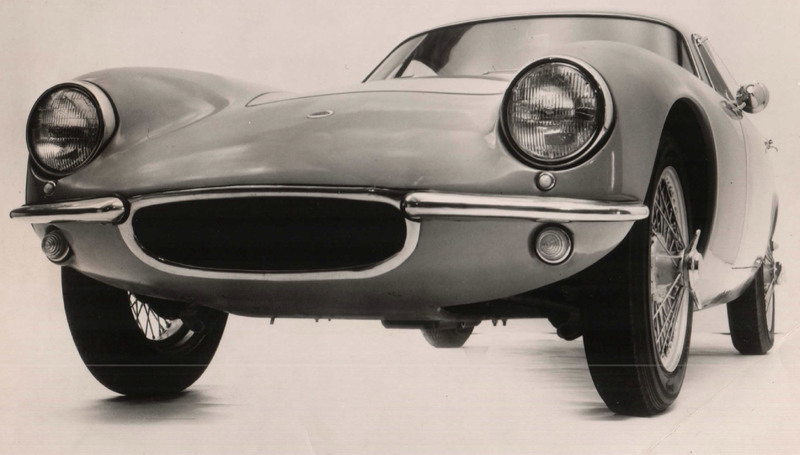 The scuttle height would be determined by the height of the Coventry Climax all alloy, single overhead cam engine. It would be the type FWE (featherweight Elite) at 1220cc. This capacity was chosen so the car could compete in the new 1300cc class at Le Mans. The car was to have a 4 1/2 inch ground clearance and the cabin space was to be designed for an averaged sized driver and passenger. Chapman, incidentally, felt he was average size so used his own 5 ft 7 in height. Luckily, when the prototype was built this space was increased to accommodate a 6 footer as well! Consider for a moment how advanced Chapman's idea was. A fiberglass monocoque (never been done before), advanced aerodynamics, 4 wheel disc brakes, an all alloy engine and imminently suitable for road or track at the 24 Hours of Le Mans no less! 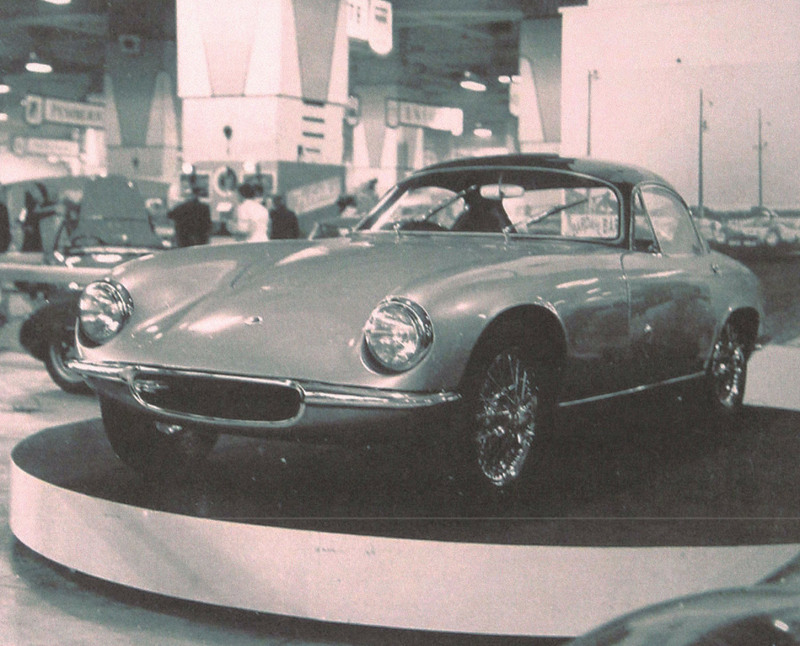 The first several cars were built at the shops in Edmonton and were properly called prototypes. Besides development work on production and design refinements most of these prototypes were raced with great success including the third car built. This was registered as WUU2 and raced by Peter Lumsden. 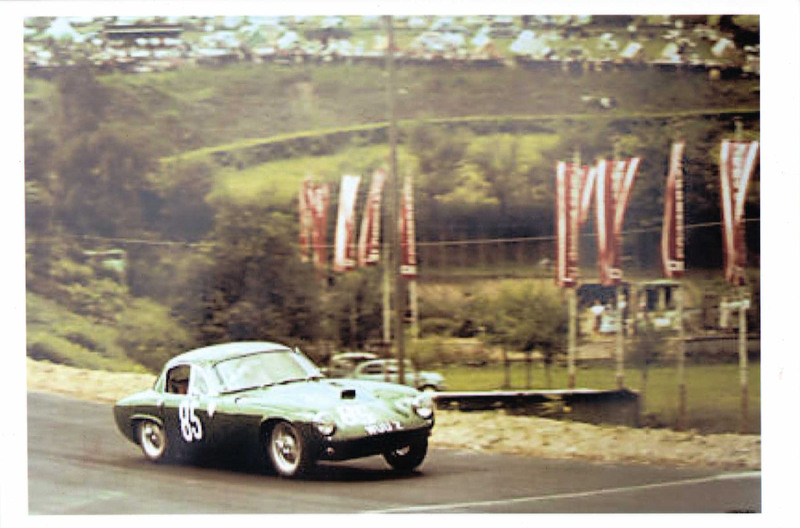 It took a class win at Le Mans in 1959, the first of six consecutive wins at this prestigious 24 hour race! Colin Chapman's goal was realized. Not surprisingly, the Elite was a successful racer at the club level as well. In 1960 Peter Kirwan-Taylor, who'd advanced into the world of international finance arranged a loan for Chapman to build a new, purpose built factory in Cheshunt. The move coincided with a change of contracts for the suppliers building the Elite's body/chassis. The first builder was Maximar, well known as a sport boat manufacturer. Following the prototypes which were built at Edmonton about 250 body/chassis were done by them. The next contract was awarded to Bristol Aircraft Company who built the next series of cars for a total of slightly over one thousand during the six year production run. The change to Bristol also signaled the change to a Series 2 configuration. This development was an improved rear suspension pickup which went from a dog legged single arm to a true wishbone. During the car's production run several other improvements were made to interior panels and stage of tune for the engine. The normal gearbox was an MG unit but an option became an all synchro, close ratio box built by ZF. Unfortunately the build process ran into problems at Bristol when the layups for the differential and rear suspension mounts were done improperly and failures were experienced. These failures were quickly remedied by some metal reinforcements at the weak points. The production methods were ultimately fine tuned which returned the Elite to its original design that required no metal inserts. Production ended in 1963 after a run of about 1030. The exact figure may never be known because there were a number of body/chassis left at the Bristol works and at Lotus that were not included in the factory build sheets. Many called the Elite a failure, including Colin Chapman who said he lost 100 Pounds Sterling on every car built. Judged in these terms there was no doubt the build process was way too expensive for an underfunded company. That and the mid-production suspension and differential attachment problems led to the Elite being termed as fragile and unreliable. Today all of the car's mysteries have been unraveled and there are well established fixes for all of the car's problems. There is a strong support network in clubs dedicated to the Elite in both the UK and in America. www.lotuseliteworldregister.com contains virtually all of the information an owner or interested enthusiast needs to sort out the purchase and maintenance of this racing car for the road. The Yahoo Mk 14 Group was created in 2000 as "A forum for the discussion of matters pertinent to the operation, preservation, or enjoyment of the 1959-1964 Lotus Model 14 Elite automobile".